To give the simplest summary of the latest film from Ridley Scott and first-time screenwriter Cormac McCarthy, the Counselor (Michael Fassbender), deeply in love with his fiancée Laura (Penelope Cruz), tries to make a quick score in a one-time drug deal with Reiner (Javier Bardem), his girlfriend Malkina (Cameron Diaz) and middleman Westray (Brad Pitt). The deal backfires, and now The Counselor is wrongfully targeted by a Mexican drug cartel. So Cormac McCarthy, Ridley Scott, Michael Fassbender, Brad Pitt, Javier Bardem, Penelope Cruz and Cameron Diaz in a monumental cinematic failure, what happened? Let’s be clear. The true author of The Counselor is Cormac McCarthy, not Ridley Scott. The artistic choices that McCarthy is attempting with the script are evident. He seems to have a disdain for exposition, as most of the scenes start and end before the typical story movements in a plot. What remains are these existential conversations that occur after a lot of the action has taken place. McCarthy thinks that by removing story explanation, the film’s themes and ideas will float to the surface. The dialogue just drones on and on and on non-stop, having the viewer scratching their heads trying to keep up with it. As a result, there is no time to absorb the themes and ideas that McCarthy is trying to communicate. Audiences can tune to a different syntax (i.e. Yoda or Nadsat from A Clockwork Orange) and absorb heavy themes, but it is hard to do both at the same time. Michael Fassbender carries the film sufficiently on his shoulder by adding as much believability as possible and together with Penelope Cruz make a good solid emotional anchor with their love story. Javier Bardem does his trademark brand of ‘psychotic hair acting’, fashioning a spiky hairstyle that looks like he is forcibly pulling out his hair with hair gel. Brad Pitt’s character just seems like an odd combination of character quirks that comes off more shallow. It is hard to buy Bardem and Pitt’s characters because gangsters would never philosophize and advise their underlings like old wise sages. Cameron Diaz is the odd one out and it is hard to judge her performance. It took me a while to realize that Malkina character was from Barbados, and apparently she put on an accent for it, but it was undetectable. The role is something we never seen from Diaz before and it is a wild explosive left-field character. I just don’t know what to make of it. Every actor is delivering on what is written, but it’s hard to judge if it’s good or bad acting because the performances do not add up to the sum of its parts. The actors are not to be blamed. The final conclusion I can draw is that director Ridley Scott and the cast believed that Cormac McCarthy has written something great and have proceeded to honor it by acting it out unedited as if it was Shakespeare. Had they been more critical about the screenplay and its mechanics, something more profound definitely could have been made. From what McCarthy is trying to say with these themes, he would have done better by just writing a philosophy paper about greed and corruption. As a bleak morality tale, it is not at all compelling. 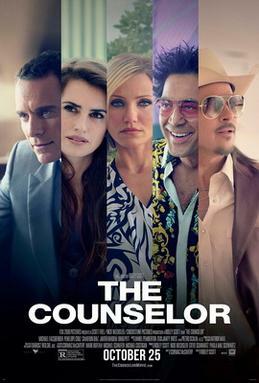 The Counselor is not a film I would recommend people to see for leisure, but anybody with an interest in screenwriting should give it a watch to study the forensics and learn what not to do, even if you are a critically acclaimed novelist.